This week’s guest curator is Whitney Hawkins Goodman — a licensed psychotherapist and owner of The Collaborative Counseling Center in Miami. 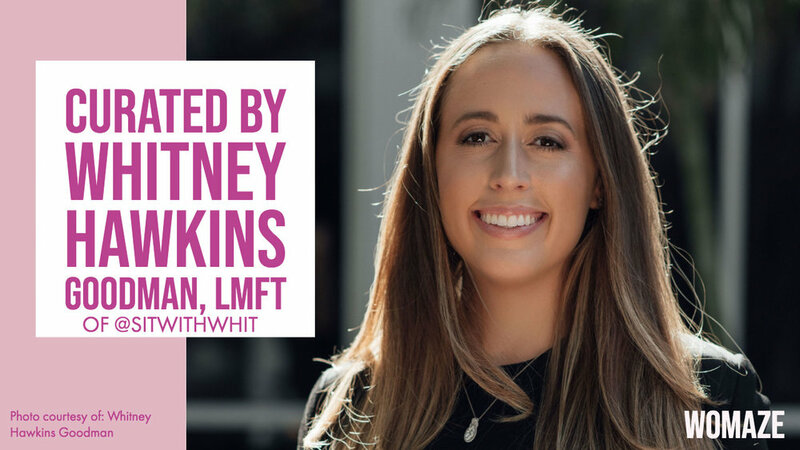 We first learned about Whitney through her incredible Instagram account, @sitwithwhit, and we knew she’d have amazing tools to share with the Womaze community (and we were absolutely right about that!). Over the years, Whitney has worked with a variety of populations, including cancer patients and the chronically ill, couples recovering from affairs and addiction, people with anxiety or depression, and adults addicted to substances or in early recovery from addiction. She is also the founder of The Collaborative Counseling Center, which is Miami’s co-working space for mental health clinicians. The CCC provides clinicians with everything they need to run a vibrant private practice, from office space to marketing assistance. We are so moved by the work Whitney does and by the tools she shares through social media. We hope the videos, articles, and quotes in Whitney’s channel help you and remind you that you are supported and guided.